These are notes from the 2 p.m. meeting. The meeting was called to order at 2:03 pm by our President, Frank Pojman. Chuck Palmer guided us in prayer followed by the Pledge of Allegiance. Secretary: Marie Lansky read the minutes from the November meeting which were accepted with no changes or corrections. Treasurer: Brenda Kocevar, read the Treasurer’s report. No corrections or additions. Report will be submitted to Skip Weithman, Association Auditor. The By-Law Committee will meet on January 22nd to review the By-Laws and make any needed changes or adjustments. If you have any comments, questions or suggestions for the By-Laws Committee please submit them in writing to Wanda or call her at: 235-8544. Thanks to the generosity of Homeowners, each recipient of donated food also received a $10.00 gift certificate to Marc’s both at Thanksgiving and Christmas. Mary thanked everyone for their generosity and read a “thank you” note she received from one of the recipients of the food program. We’re going to MGM Casino in Detroit on March 9th, 2004. Fee: $30.00 with $15.00 coupon for use at slots, restaurant or gift shoppe. Leaving the German Club at 7:30 a.m. Everyone 21 years and over is welcome on this trip. For more information, please call Mary Jane: 427-1685 or Wanda: 235-8544. Greeted fellow Homeowners and detailed some of his activities since Election Day. The newly formed Citizens Advisory Committee will have a strong voice in Township government. The CAC is looking for retired firemen and policemen to serve on the committee. Please register and VOTE. In 2 years, we will be having Presidential and Trustee elections. In an effort to keep our data base current, please call Chuck: 235-9460 and let him know if you have any new neighbors or if there are any move outs on your street. 760 Homeowners’ have joined for 2004. If you haven’t payed your dues for 2004 as yet, you may drop off $5.00 at the Palmer’s residence at 21 Periwinkle. You may also pay your dues at the Social Hall from 9am to Noon on Friday, January 9th. After 2 years, the PUCO matter is resolved. The Park Owners were granted a 3.3% increase in sewer rates but those will not go into effect until the owners comply with some required improvements. There will be NO increase in water rates from the owners. There is, however, a rate hike coming from the City of Cleveland Water Department. No information on how much Cleveland’s rate hike will be. COURT CASE: Pre-trial hearing is scheduled for 2/26 at 9 am. This is a closed meeting. Only the lawyers would be allowed in the Court Room. CUYAHOGA COUNTY COMMISSIONERS: The 2nd meeting of the Cuyahoga County Commissioners and park owners is scheduled for next week. This also is a closed meeting therefore no date or time is given. The Park Owners have taken the Park Expansion issue to Common Pleas Court. They are attempting to overturn the 1986 ruling made by Judge Gorman. The latest edition of Ho/T News contained some incorrect information. Owners of Manufactured Homes may not pay their taxes on a month basis. Only those who own real estate are offered this option. The supervision of manufactured home parks is currently under the control of the Health Department. Senate Bill 102 will put the control of mobile home park regulations in the hands of park managers, mobile home sellers and mobile home manufacturers. The passage of SB 102 would deliver a severe blow to park homeowners and tenants. The Cleveland Tenants Organization is establishing a coalition to fight the passage of this bill. These are notes from the 11 a.m. meeting. The March 11th meeting of the Columbia Park Homeowners/Tenants Association was called to order at 11:00 am by our President, Frank Pojman. Pat Bittner guided us in prayer followed by the Pledge of Allegiance. SECRETARY: Marie Lansky. Motion to abstain from reading the minutes of the January meeting was made, seconded and approved. The By-Law Committee met and changes to the By-Laws will be reviewed at the May General Meeting. Bob Hyduck (235-4224), new Trustee for Area 3 was sworn into office by Mrs. Rudary. Assistant Trustee for Area 3 will be Dorothy Wasserman (235-0520). Cost of printing of Ho/T News at Office Maxx has been reduced and adjusted by Manager. If you do not receive your copy of the Ho/T News, please call Duane at: 235-4413. Previous issues of Ho/T News are available at the kitchen area of the Hall. MIKE FOLEY, Cleveland Tenants Organization Director, updated Homeowners on the status of our case in the Court of Common Pleas. Details of his presentation are for Homeowners/Tenants Association Members only. If you are interested in knowing what Mike had to say: Please call your Area Trustee for details. On April 17th, The Cleveland Tenants Organization will be holding a meeting at Cleveland State University to put together a “people platform” which we will be presented to the Democratic Party for consideration. Affordable housing, Health, Eduacation &amp; Jobs are the issues that will be addressed. Thanked Homeowners for their generosity. Please get to know your neighbor! Notify someone if you see no activity going on. Please let your neighbor know if you’ll be out of town. Looking out for one another is the best defense we have. A great turnout and our thanks to Mary Jane, Marion Wolf and Wanda Rudary for putting together such a wonderful trip. The bus trip added many needed dollars to our legal fund. Dustin Ramsey from the County Auditor’s office is coming to the Park to help Homeowners with challenging their real estate taxes. The deadline for filing a challenge is March 31st. March 18th from 1 to 3 pm. for questions &amp; answers. March 25th from 1 to 3 pm. challenges accepted. A notary will be here to notarize challenges. Both meetings will be in the Social Hall. In response to Park Owners letter in the February issue of Park News, Frank read a letter that he sent to Park owners and Country Administrator, David Rines. Bev Smith and AnneMarie Donegan, Olmsted Falls City Council Members, explained CERT to Columbia Park Homeowners and requested volunteers from the membership. The Homeland Security Department has mandated that every community establish an Emergency Response Team to prepare for an attack, especially one that is biological in nature, and to be ready to vaccinate all the citizens in the community in 4 days. AnneMarie explained that she needs at least 60 volunteers for a variety of assignment. Medical experience is not required. She passed out forms to the members willing to volunteer. Please return the forms to the Drop Box at 87 Periwinkle or bring them to the Social Hall on Friday, March 12th from 9 to noon. On Saturday, April 17th, there will be a practice run thru during which the Department of Health will be videotaping. Time TBA. Will be available to Homeowners after the meeting regarding any concerns related to the Township issues. SB 102 and HB 310 deal with establishing a Manufactured Home Commission. As presently written, this legislation strongly favors the manufacturers of the homes, the dealerships that sell homes, The Ohio Manufactured Home Association and manufactured home Park Owners. The supervision of manufactured home parks is currently under the control of the Ohio State Health Department. House Bill 310/Senate Bill 102 will put the control of mobile home park regulations in the hands of park managers, mobile home sellers and mobile home manufacturers. In it’s pesent form, this legislation would deliver a severe blow to the owners of Manufactured Homes. On Monday, March 8th, State Representative held a meeting at Olmsted Falls Middle School to hear what Columbia Park Homeowners had to say regarding this piece of legislation. He encouraged every Homeowner to contact their legislators in Columbus and let their voices be heard. tell him NOT to support SB 102. Saturday, June 19th at 2 pm. 9 Hole Scramble with lunch at 5 pm. Get a group together and join in the FUN!! Meeting adjourned at 12:45 pm. These are notes from the 2 pm. meeting. Secretary Marie Lansky. A motion to suspend the reading the minutes of the March meeting was made, seconded and approved. Treasurer Brenda Kocevar. Treasurer’s report given by Frank Pojman in Brenda’s absence. No corrections or additions. Report will be submitted to Skip Weithman, Association Auditor. Nothing new to report on by-laws at this time. 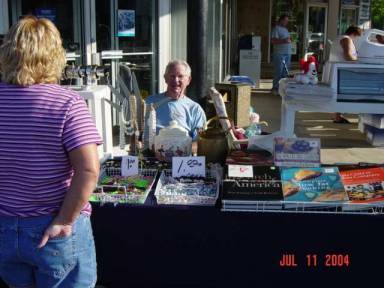 Announced that Management would be holding a Flea Market once again this year on <font color=”red”>Sunday, July 11 from 8 am. to 3 pm. Flea Market. 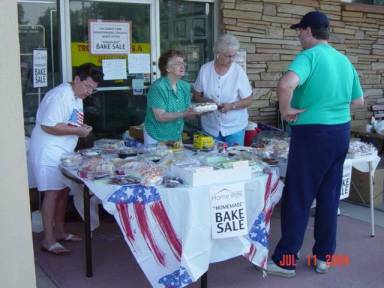 Homeowners will once again be sponsoring a Bake Sale at the Flea Market. Please bring your donations at 8 am. on the morning of the Flea Market. Ho/T News was delivered last Sunday. If you did not recieve a copy, they are available during the meeting. Duane is looking for more volunteers to deliver the News and to type the Newsletter. The Homeowners Association now has 932 members. 30 NEW Homeowners joined the Association last month. Membership numbers are down, however, due to the death of some members and those who have moved out of the park either because they had to or because they wanted to. Marty updated the membership on his recent discussions with David Rimes, Assistant to the Cuyahoga County Commissioners. No further details of his update will be shared here. For more information, please call your Area Trustee. The Food Bank was able to give a $10.00 gift certificate to Food Bank recipients for Easter. VFW Post #387 donated peanut butter and jelly to the Food Bank thanks to Marti Moser. Cases of Ensure are occasionally available. If you would like some Ensure please notify Mary. There will be no food collection until the Fall Meeting but the money can will be at each meeting for donations. God bless all of you for your generosity. Management will once again waive Summer Sewer charges. Processing of bills will be delayed due to software problems and will probably not be sent out until sometime in June. Management has been issued a Certificate of Convenience by PUCO. The PUCO has ordered that a SMOKE TEST be done on the sewer system here. An outside engineer will be doing the testing on July 12th. Testing will last approximately 1 week. A letter will be sent to every Homeowner explaining the Smoke Test. If for some reason, the testing is not done the week of July 12 then the alternate date is set for August 9th. Our “thanks” to the PUCO for limiting the increase in water rates to 3% instead of the 300% that Management requested. The Olmsted Township Trustees sent a resoulution to Management at Twin Oaks II and Columbia Park requesting that they refrain from rent increases that are higher than the “cost of living” index. Hazardous Waste is being collected at the Town Hall until Monday, May 17th. They will accept non-latex paints, varnish, insecticides or any other hazardous material. Look for these containers. Cox Cable is now broadcasting the Trustee Meetings for their subscribers on Wednesdays at 8 pm. on Channel 45. Arrangements are currently underway to make the broadcast available to Olmsted Cable subscribers as well. Management is once again applying to the Olmsted Township Board of Zoning Appeals to expand the Park by adding 34 new homesites. Expansion of the Park would not only add to the value of the park when the time comes for us to purchase it but also adds to the sewage treatment problems. Furthermore, Judge Gorman’s 1987 has never been followed. He specifically ordered another entrance to & exit from the Park onto Cook Road be installed. This was never done. He ordered buffer zones be established. This was never done. The Olmsted Township Board of Zoning Appeals will hear Management’s request on:Wednesday, May 19th at 7:30 pm. at The German Club. Please plan to attend and fill the Hall. Copies of the expansion application are available at the Olmsted Township Building Dept. on Cook Rd. If you are unable to attend the meeting, you can write to the Board of Appeals at 26900 Cook Rd. Olmsted Township OH 44138. The Social Worker from Northwestern Healthcare Center addressed the membership regarding Ohio’s planned $120 million cuts to Medicaid. She explained that such cuts would cause many nursing homes to close as well as the layoff of hundreds of staff members. The Nursing Home industry is the 2nd most regulated industry in Ohio second only to Nuclear Power Plants. 70% of the residents in Nursing Homes are on Medicaid. Medicare cuts would surely result in less care at a time when it’s most needed. Please tell your Representatives in Columbus that SENIOS say “no” to cuts. Thanks to the individual who donated money anonymously and requested that our Association leadership reply to the testimonials currently being published in the Park News. Betty Morgan, from the Cuyahoga County Department of Senior & Adult Services spoke to members regarding the Benefits Check Up Program. She explained that the Benefits Check-up Program is a totally anonymous, web-based program for individuals 55 and over and have a limited income. Even those close to the income cutoffs may be eligible for some benefits. Representatives from the Office on Aging will be in the Social Hall one <font color=”red”> June 7th</font> from 10 am. to 4 pm. to assist Homeowners fill out questionnaires for benefits. No identification is required but please bring your list of medications. The Office on Aging Representatives will return on June 14th with your results and will explain what if any programs you may be eligible for. Norb Fox is currently working with his committee to establish a memorial fund for Columbia Park Homeowners. to Matt Norris who once again won the 70+ class in the 26 mile Cleveland Marathon. 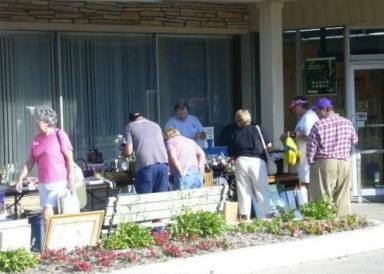 Management is sponsoring Columbia Park’s First Annual Community Patio Sale on Sunday June 13th from 9 am to 3 pm. If you would like to participate, please make your reservation by calling Jessica at 235-5300 (days) or Carol @ 235-4826 (evenings & week-ends). A sign-up sheet is also available at the front table during the meetings. Management will donate fliers, balloons and an ad in the Sun Newspapers. Deadline for reservations is May 28th. Management will host a PICNIC on the grass near the gazebo on Saturday, June 26th from 12:30 to 3:00 pm. Management will provide hot dogs, hamburgers, condiments, pop & beer. Please bring a covered dish, salad or dessert. Reservations are required and limited is limited to residents only! A new social group is forming for Singles in the Park. The first meeting will be on Wednesday, June 9th at 7 pm. Light refreshments will be served. Meeting adjourned at 3:15 pm. Another attempt by the owners of Columbia Park to add 34 more sites for large manufactured homes was presented to the Township Board of Zoning Appeals at the May 19th meeting held at the German Club. The meeting was held in a basement room with no sound system, making it difficult for the approximately 75 park homeowners in attendance to hear what was being said. It appeared that nothing in the owners plan has changed significantly from their previous proposal which was rejected by the board last year. * detailed plans for the bridge needed to access the proposed new home sites. * impact of expansion to Cook Road residents. HTA President, Frank Pojman has written to our Township Trustees asking that the next meeting of the Board of Zoning Appeals planned for June 16 be held in a ground level room so that homeowners won’t have to climb stairs and that the agenda be limited to only the park expansion. Notes taken by Carol Fink at the 2 pm. meeting. The July 8th meeting of the Columbia Park Homeowners/Tenants Association was called to order at 2:00 pm. by our President, Frank Pojman. Rita Smith guided us in prayer followed by the Pledge of Allegiance led by Olmsted Township Police Chief, William Davis. Following the Pledge of Allegiance, Chief Davis who comes to us with 16 years of experience in the Dayton area was introduced. He passed out “Get out of jail FREE” cards which are actually his business cards. ‘Vacation Watch’ program is available. Police will check your home while you are gone. More cruisers will be coming thru the Park. Twice a day by day-shift officers and twice by night-shift officers. He acknowledged respect for all 3 Trustees. He will hold his staff accountable. Lt. Minnick is currently attending FBI Academy. Consumer Response Cards will be introduced so that residents can evaluate police department performance. Police Officers will receive annual evaluations. ‘Cops for Kids’ Program starting which will give officers an oppurtunity to interact with children and teens. ‘Ride-Along’ Program: encourages everyone to ride along with the police. It gives you an oppurtunity to see what they do. He wants to know everyone’s opinion. A new computer system for the police department will give officers more time on the road. Plans to attend many HTA meetings and sit among members. SECRETARY: Marie Lansky. A motion to suspend reading the minutes of the May meeting was made, seconded and approved. TREASURER: Brenda Kocevar. Treasurer’s report given by Pat Patterson in Brenda’s absence. No corrections or additions. Report will be submitted to Skip Weithman, Association Auditor. Nominations for Recording Secretary and Trustee for Area 5 are needed and will be announced at the September meeting with voting and installation at the November meeting. 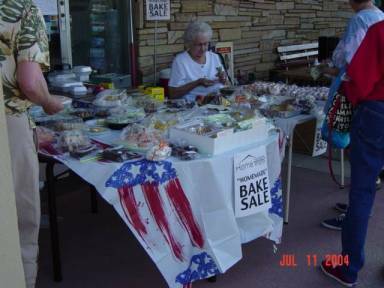 Homeowners Association will once again be sponsoring a Bake Sale at the Flea Market on Sunday, July 11 from 8 am. to 3 pm. Please bring your donations after 8 am. on the morning of the Flea Market. The Homeowners Association now has 947 members representing 672 homes. 2 new members were introduced to the membership! After receiving letters from Park management, 2 pages have been removed from our website. The page comparing Gypsum Mills to Columbia Park and the pictures of vacant lots and crumbling streets have been removed. Food Drive will be held at the September meeting. We may be in need of a new storage shed for Food Bank supplies. If your storage shed is available, please let Mary know. Your generosity is truly appreciated by all the recipients. The Memorial Book and Plaque were displayed with names of passed members who have been memorialized. Guidelines:The Memorial Book will contain memorialized persons name and picture, if desired. If the person is a HTA member: name goes on Plaque and in Book. If the person is a non-member: name in Book but not on Plaque. In lieu of flowers, make contribution to Columbia Park Memorial Fund and deposit it at the Columbia Park Office. What to do if we get another rent increase at the end of the month?<br>Frank wrote to Mike Foley requesting that he intervene with Park Owners. Ken Miller reported that the Spring Golf Outing was a tremendous success. 39 golfers and the dinner afterwards raised $490 for the Homeowners Association. A 3-day 2-nites trip to Washington DC is scheduled for departure on Sunday, September 12th with a return on Tuesday, September 14th. Cost: $308.00 per person. Please call Biff Whittaker at 235-9050 to reserve your seat. Trustee Fink read a letter from the Renaissance Helth Care Center regarding their plans for a Community Recreation Center. More details to come later. Olmsted Township Trustees Midyear Report is now available. You can find the link on the opening page of our website. Frank received a letter from Tammy at the Olmsted Township Building Department about our behavior at the Zoning Board of Appeals Meeting. &nbsp;Pat responded to the letter. Pat Patterson announced that our Homeowners Association has endorsed the Coalition to Build a Better Medicare Program. The new Medicare Prescription Drug Law goes into effect in 2006 and the way the law is currently written it appears that the biggest winners will be the private insurance companies, HMO’s and the pharmaceutical companies. American Seniors will be the losers. The Coalition is organizing to change the new law and the Columbia Park Homeowners/Tenants Association supports that mission. Buyers and Sellers meet to once again prove that an old saying is true . . . . .
“one man’s junk is another man’s treasure”. Linda Hes, Lee Aldrich and Biff Whittaker prepare for the lunch crowd. Thanks to Biff and Lee for organizing this event. George Pirkel, videographer at the Olmsted Township Trustee Meeting set up the video equipment so that the trustees meeting could be seen! Hopefully, the tapes will someday be broadcast on Channel 6 for Columbia Park and Renaissance viewers. It is currently shown on Cox Cable Channel 45 on Wednesdays at 8 pm. 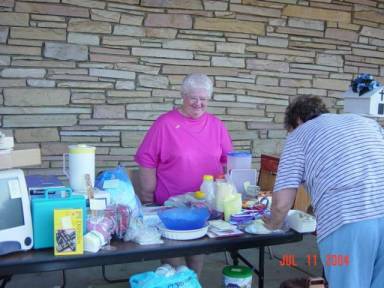 prepare the delicious baked goods “for sale”. So many wonderful baked goods were donated that another table is added! That’s Wanda pricing all the new donations! Thanks so much to those of you who baked such wonderful goodies!! Check out some of the great stuff our Sellers were offering !! 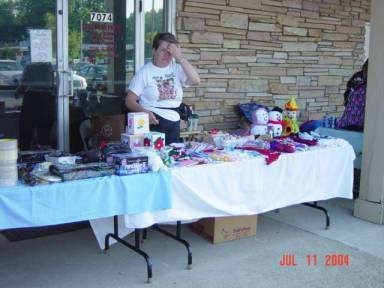 Lori Aldrich, Lee’s daughter with lots of goodies for sale. Crafts anyone? 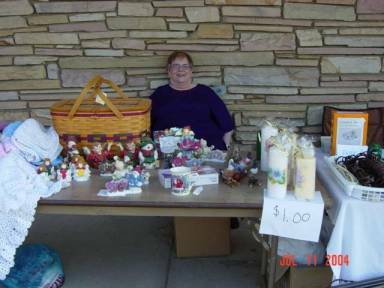 A great selection of crocheted items and other crafts offered here! 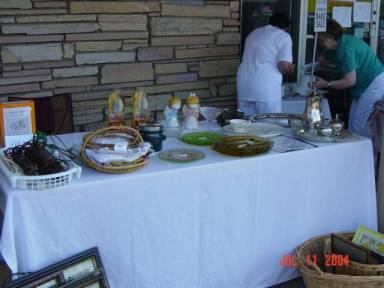 Marge Lechner offered depression glass, antique picture frames, silver tea set, fine china and even FREE extension cords. Bob Medar is selling glassware and tons of other goodies! 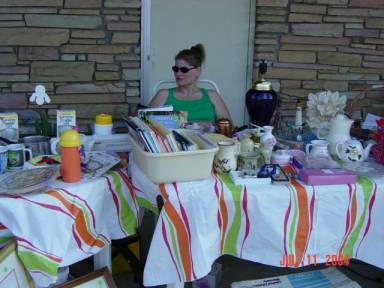 Perky Miss Dottie Patti offering some her lifetime treasures to discriminating buyers. 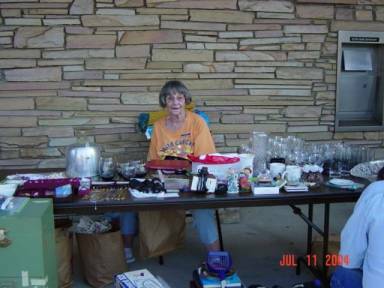 Marcia Noel with her treasures for sale just waiting for the buyers to clean her out! Carol Rieff offered handmade afghans, christmas decos and candles at her table. Jim Carr, HTA Trustee, greets his buyers with a big smile. JoAnn Carr, offered tons of jewely and her Avon Products. A popular spot with many of our shoppers!! A very big ‘Thanks’ to Biff Whittaker and Lee Aldrich who planned and organized this event. Thanks, guys for another smashing success! The Township Board of Zoning Appeals met August 10 to <u>once again</u> consider a proposal by the owners of Columbia Park (L.L.C.) to build more home sites on the other side of the creek in the southeast area of the park. <u>Once again</u> the Board ruled that the owners must provide more information about the project. And <u>once again</u> a decision was tabled until the Board’s next meeting. So what’s new and interesting? Another interesting point brought to the Board’s attention during the August 10 meeting was that the park’s former owner erected a modular home on a Cook Road lot that could have been used for the court-ordered second access road to the park. This information led the chairman of the Board of Zoning Appeals to ask, “How did he get away with that?” Many of us would like an answer to that. An even more important question is when will we get that second access ordered by Judge Frank Gorman in 1987? Pat Patterson brought up the interesting issue of “hardship” near the end of the meeting. Appeals are traditionally granted on the basis of “hardship”. Namely, following the zoning code would cause the individual a hardship. http://www.olmstedtownship.org/BldgZong/ZoningCode/zone430.htm#430.07&#8243; for more information regarding the Powers and duties of the Olmsted Township Board of Zoning Appeals. With regard to the Columbia Park owners appeal for expansion, it’s not clear what the basis of their appeal is. The next meeting of the Board of Zoning Appeals is Wednesday, September 29, 2004. Outside the Social Hall, members of the Columbia Park office staff handed Homeowners coming into the meeting a handout from Brenda Parker, park manager, along with a copy of a letter written by Anthony Coyne, the attorney representing the owners at the Board of Zoning Appeals. &nbsp;The handout titled: “WHEN IS ENOUGH . . . ENOUGH?” asks a good question! Now all we need is an answer from our owners. When will the rent increases be enough for you? Notes taken at the 11 a.m. meeting. The September 16th meeting of the Columbia Park Homeowners/Tenants Association was called to order at 11:05 a.m. by our President, Frank Pojman. Pat Bittner, Association Chaplin, guided us in prayer followed by the Pledge of Allegiance. A moment of silence was observed in memory of Area 3 Trustee, Bob Hyduck, who died on September 10th. Norb Fox, chairman of the MEMORIAL FUND, thanked the following committee members: Linda Hes for typing Memorial Book pages; Bunny Ney for sending out letters acknowledging contributions; Jim Carr for designing and making the shelf for the Memorial Book and Bob Hyduck for finishing the shelf. Frank announced that there is an article in the Sun News about the Memorial Fund for those who would like to read it. SECRETARY: Marie Lansky. Read minutes of July Homeowners Association meeting. Brenda Kocevar questioned “what was gained from rent strike? Nothing.” statement. Frank clarified by reading a list of accomplishments that resulted from the rent strike. Minutes accepted after clarification. Seconded and approved. TREASURER: Brenda Kocevar. Treasurer’s report given. No corrections or additions. Frank reported that the Association received a check for $21.00 for voter registrations. Report will be submitted to Skip Weithman, Association Auditor. Thanks for all the donations at today’s meeting. Food Bank has diabetic syringes available for those who may need them. If you are on food supplements such as Ensure or Boost, please give your name to Mary so that she can put you on her list. Coin can is available for your pocket change. If you or someone you know would benefit from the Food Bank, please put the information on one of the little slips on your table and deposit it in the coin can. Your generosity is truly appreciated by all the recipients. Please fill out new forms before departing for your winter destination. This will insure that you get emails and the Ho/T News while away. Dorothy Wasserman will continue as Assistant. Voice vote taken. All yeahs; 2 nays. 1) Dorothy Wasserman changed her mind and decided to accept Area 3 Trusteeship for the remainder of 2004 with Ann Palmer as her assistant. Rose Mary Wettach withdrew. 3) Pat Bittner nominated for Assistant Secretary & Historian. Elections will be held in November with installation after voting at the 7 p.m. meeting. PAT PATTERSON regarding handout from Brenda Parker: Pat addressed the membership stating that she responded to the attorney’s letter in detail and has sent her response to the Olmsted Township Board of Zoning Appeals. Pat pointed out that Attorney Coyne’s letter (Page 3, Paragraph 3) resurfacing of Flagler, a cost to date of $65,000. If you say it’s done, it should be done. (I am paraphrasing Frank here!) Read Frank’s entire message. In 2001, when homeowners were subjected to an unconscionable rent increase, we organized ourselves into the Homeowners/Tenants Association. We staged the largest rent strike ever held in Ohio . We received support from many organizations and faced many challenges. But our new owners goal is to make money at our expense. We tried negotiating without success. We appealed to the Cuyahoga County Commissioners to help us to own the park. We put together an acquisition team and United Church Homes agreed to be our financial partner. Ten months ago, there was talk of another entity interested in helping us. This option was never persued. In July when the new leases arrived, homeowners that could least afford it received increases of 7.2% plus $6.00 to pay for the owners’ property taxes. More homeowners realized they could no longer afford the increases and 3 more left. Frank said he was told by one person, “you are scaring people”. He explained that it is not his intention to scare people but believes people have a need and right to know. The new people don’t know the heartache of 2001. Feels he was elected to do whatever it takes to solve the problem. The entity interested in helping us achieve our goal of owning the park as a co-op is the Cleveland Metropolitan Housing Authority. The name has a stigma attached to it that the new directors are trying to change but their mission remains the same – affordable housing. On August 4th, our attorney Mike Foley, Marty Gelfand, George Engle, Chuck Palmer, our Assistant Vice President (Pat Patterson was away on vacation) and Frank met with the Housing Authority to explain in more detail what life in Columbia Park is like. We were invited to present our story in greater detail to the CMHA Board of Commissioners on September 1, 2004. Present were Mike, Marty, George, Pat and Frank. Also supporting us in attendance were Chuck Palmer, Assistant Vice President, Brenda Kocevar, Treasurer and Jean Katitus, past Secretary and Karen Straka, Olmsted Township Trustee. Ted Fink wanted to be there as well but was in the hospital. We want their help taking the property thru eminent domain. We are still waiting their decision. We will continue to do whatever it takes to own our community. You, the membership, will make the final decision. It may be the most important decision you will make as a Columbia Park homeowner. Chuck gave a further explanation of the graph shown below and on the last page of the September 2004 edition of Ho/T News. The graph clearly demonstrates that Cost of Living Adjustments increased 40% while our rents increased by 77%. Based on what we have already experienced, we can only expect that the gap between cost of living adjustments and our rent increases will only get wider and wider. Mike gave a further explanation of Cleveland Metropolitan Housing Authority as an option for Columbia Park Homeowners. CMHA is a housing authority. The Cuyahoga County Commissioners are doing nothing probably because the staff has changed. The meetings between commissioners, the Homeowners Association executive board and owners went nowhere. Cleveland Tenants Organization has a long-standing relationship with CMHA and can substitute for the County’s role. You would own your home in a co-op. This group knows how to do eminent domain and CMHA has eminent domain power. Eminent domain in our circumstances is okay under Ohio Law. 1) no cost to them. HUD pays legal fees. CMHA is a substitute for the County. Our park will not be public housing. assured members that the final decision in this matter would be up to the homeowners. They have a voice in this matter. Our park will not be public housing or Section 8. There is paper and pencils on every table. If you have any questions, comments or fears, please write them down and deposit them in the box here on the table. If you want a call back, please include your name and phone #. Question and Answer period followed. Pat Patterson and her PAC Committee have been hard at work on the real estate tax issue that effects those homeowners who purchased a home in 2000 and are taxed under the new real estate tax laws. We believe that a home is a home not real estate. We should not be taxed on preparation or concrete. The Cuyahoga County Auditor will meet with his legal advisor. For those homeowners that filed with the Board of Revision, hearings will be held in the Social Hall on September 30th and October 1st. You will be notified via snail mail of your appointment time. These are private appointments so be sure and be at the Social Hall at your appointed time. 2005 applications for the Board of Revision will be available in December for those who need them. There are many hazards in the new Medicare law. Brenda Kocevar has been attending the meetings held by the Coalition to Build a Better Medicare Program. There are petitions on the tables for you to sign. Despite the fact that the bank closing is a done deal, we will be sending the petitions we signed to the President of the bank. The meeting will be held on Saturday, October 16th from 9 a.m. to 4:30 p.m. at the Airport Holiday Inn, 4181 West 150th Street at I-71. The fee for the entire program – including lunch, morning and afternoon refreshments and all program materials is $15 if payed by September 30th ($20 after that date). Make checks payable to Cleveland Tenants Organization and mail them to: CTO, 3631 Perkins Avenue, #3A4, Cleveland OH 44114. Please mark the envelope with: ATTN: Manufactured Home Summit. As you all know that since that dreadful September 2001, when we were give an unconscionable rent increase up to 32% in some cases with most in the 18-25% range. You showed our owners that you were not gong to sit back and take it. You contacted our political leaders and asked for help. Congressman Kucinich’s office gave you Marty Gelfand who in turn gave you Mr. Mike Foley. 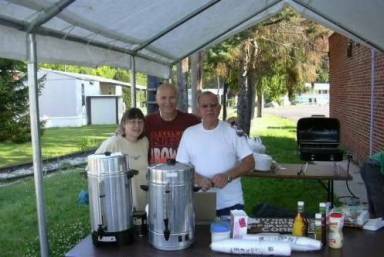 Together with Marty and Mike you organized the Columbia Park Homeowners/Tenants Associa-tion. After formation and organizing of this Association you created the largest rent strike in the history of Ohio. You have shown support for your Association through the last three years. You have seen the results in our community from that fateful decision by our out-of-state owners. From that day forward we have received many challenges from them who have proved that their only interest is to make a lot of money at our expense for which they call the “American Way”. Attempts were made to solve our issues to no avail and you have indicated to your Association many times to keep going, that we must prevail in order to control our destiny. We worked with our Cuyahoga County Commissioners and other County officials to help us bring an end to your frustration and feeling of uncertainty by attempting to find ways of owning this property and making it ours. We put together an outstanding group of individuals to be a part of the Columbia Park Acquisition Team including United Church Homes as you partner, to be ready when our owners decide to sell us this community. Approximately 10 months ago, I was asked by Mr. Foley, our attorney if we would like to talk to another entity that has shown interest in helping the homeowners in Columbia Park. At that time we were in negotiations and discussions that went nowhere. After ten months and another 6.27% rent increase ($15) to the homeowners who could least afford it and an additional $6 for a tax pass through, we began getting feedback from homeowners who have indicated that they are unable to continue to call Columbia Park home. Since our 2005 increase, three more homeowners that I know of, have made the choice to leave Columbia Park. Almost $100/Mo. in three years is too much of a burden. Many homeowners have again indicated to me that the only way to control Columbia Park is to own it. Just to clear the air, after the last membership meeting someone came up to me and said, “Frank, you are scaring the people”, this was a comment made by someone who was not even here on that fateful day in 2001. I want you to know, that it is never my intent, nor anyone else in this Association to scare anyone, people need and have the right to know what is going on in their community. New homeowners, with all due respect, will never experience the heartache that went through Columbia Park in September 2001 with fifty dollar rent increases for our homeowners on fixed incomes, living on Social Security and hope we never have to face anything like that again. Those of you who have received the September 2004 issue of AARP Bulletin, read the story, “There Goes The Neighborhood”. After reminding myself over and over again why you organized this Association, my only answer was that you elected me to do whatever it takes to solve your problem. With that in mind, it was my decision to contact Mr. Foley to make contact with that other entity to move forward once agin in another direction. I was contacted by Mr. Foley and a meeting was scheduled between members of the acquistion team, executive board and political leader to have a preliminary meeting with Mr. George Phillips, Executive Director and Mr. Scott Pollock of Cuyahoga County Metropolitan Housing Authority. Many of us remember the housing authority of the early years of the 60’s & 70’s. That stigma and cloud that has hung over that organization all of these years is dissipating. On August 4, 2004, our Attornery Mike Foley, Marty Gelfand, George Engle, Chuck Palmer, our assistant Vice-President, (Pat Patterson was away on vacation), and myself met with the Housing Authority to explain in more detail than they already knew about what our life in Columbia Park is like. Information was given to them confirming their suspicions they had before we even arrived. When our presentation was completed, Mr. Phillips and Mr. Pollock indicated they were very interested in our case and going to discuss our issue with the Cuyahoga Metropolitan Housing Authority, Board of Commissioners. After that preliminary meeting, it was explained to your council at our August 5, 2004 Council meeting. After discussion, a unanimous vote was taken to move forward to persue acquiring more information. We began to prepare for that presentation. We were invited to present our story in greater detail for the Board of Commissioners on September 1, 2004. Present were Mike, Marty, George, Pat and myself who put together an agenda and plan to speak to the Commissioners. Our case was perfectly clear that we wanted their help in taking this property through Eminent Domain. Also, supporting us in attendance were members of your Association Chuck Palmer, Assistant Vice-President, Brenda Kocevar, Treasurer and Jean Katitus, Past Secretary and Karen Straka, Olmsted Township Trustee. Township Trustee Ted Fink wanted to be there as well but was in the hospital and they wouldn’t let him leave. Our team was congratulated after the meeting for explaining our story and was done very professionally. We are still waitng for the Boards decision. We were hoping to have a decision before this meeting. I would like all of you to know, that from the beginning of my involvement with this Association and I think I can speak for Vice-President Pat Patterson as well, who is the founder of our Association along with many others, that we will continue to do whatever it takes to own our community. The next step will be taken when and if we receive a favorable decision from the Housing Authority. A plan and agenda will be put together and explained to all of us. Everyone will be able to understand what will be needed before we go forward. The bottom line well be, you the members of the Columbia Park Homeowners/Tenants Association prior to September 16, 2004 will make the ultimate decision. Now that I’ve explained to you why this was done and I hope that you will please keep an open mind on this issue until we have all of the facts, because this will probably be one of the most important decisions you will ever make as a homeowner and a member of the Columbia Park Homeowners/-Tenants Association. We need to continue to be, as always, UNITED. Now that I’ve explained to you why this was done and I hope that you will please keep an open mind on this issue until we have all of the facts, because this will probably be one of the most important decisions you will ever make as a homeowner and a member of the Columbia Park Homeowners/Tenants Association. We need to continue to be, as always, UNITED. Area 3 and 4 at 2:00 pm. Notes taken at the 2 p.m. meeting. The November 11th meeting of the Columbia Park Homeowners/Tenants Association was called to order at 2:03 p.m. by our President, Frank Pojman. Chuck Palmer, Assistant Association Chaplin, guided us in prayer. Ted Fink, Township Trustee and Veterans attending the meeting guided us in the Pledge of Allegiance. Election of Area 3 Trustee: Wanda explained that because we had 2 candidates running for the office of Area 3 Trustee, a written ballot was required. Ballots were passed out to members that needed them. Both candidates, Ann Palmer and RoseMary Wittach were introduced to the membership along with some background information about both. Members were instructed to mark the ballots and they were collected by members of the Nominating Committee. The following Nominees for 2005 were elected by hand vote. Area 3 Trustee: to be announced after 7 p.m. meeting. Read minutes of September Homeowners Association meeting. Seconded and approved. Treasurer’s report given. No corrections or additions. Submitted to the Auditor. He announced that the new Police Department building is progressing and should be ready for occupancy in July of 2005. Police patrols in Columbia Park have increased. Answered questions from the audience. Chuck Palmer addressed the letter that all homeowners received from James Martin, one of the Parks owners, regarding new rates and procedures related to water/sewers in the Park. There is NO increase in water rates but management is permitted to charge $1.57 for meter reading. Sewer rates increased by 2.6% not 8.7% as stated in Martin’s letter. If you have a complaint regarding water &/or sewers, make sure you submit your complaint to management in writing and keep a copy for your own records. You should receive a response within 10 business days. If no response, call PUCO directly or call Chuck at 235-9460 for assistance. 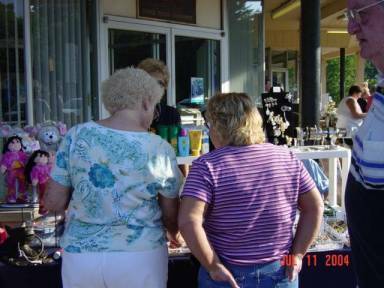 At a meeting held on October 16, 2004, 40 people from 9 manufactured home parks in Ohio, gathered in Cleveland and the Association for Manufactured Home Residents in Ohio (AMHRO) was born. Brenda Kocevar, Treasurer of the Columbia Park Homeowners/Tenants was elected Treasurer of the new State Association. Russ McPherson, who lives at Twin Oaks II, newly-elected President of the Association shared his thoughts and plans for the new State Association. He urged as many as possible to join at the State level and work to change the laws governing manufactured housing in Ohio. He encouraged us to contact Tom Patton to assist AMHRO at the State level. Tom Patton can be reached at the following address. George Cochran: manufactured home expert. Announced that our case was amended to include 2 added complaints. Explained that we are now in the pre-trial discovery phase. Homeowners that are part of the court case will soon receive an interrogatory from the owners attorneys. Our attorneys will assist us with any questions we have concerning the questionnaire. Tom Treadway, updated members on the Tax Revisions filed by 37 homeowners who purchased homes after 2000. Still waiting for an answer from the Auditor’s office. Frank read the letter from Mr. Tallie regarding CMHA’s position on eminent domain. Rent assistance is available to Homeowners thru the Park management. The 7 page application is available at the Park office. It is strongly recommended that you review the application with a family member or an attorney. If accepting assistance from management will enable you to continue living in the Park then please take advantage of the program. Park Guidelines C2 prohibits displaying political signs in the windows of your home. This guideline violates “freedom of speech” and needs to be challenged. Frank emailed the Park Manager 3 weeks ago but no response was received. Some diabetic supplies are available. Mary has some Accu-check sticks as well as insulin syringes. Grand Pacific Junction is once again offering FREE Thanksgiving Day dinners. &nbsp; Free delivery is available to single or gather a group of friends together and several dinners will be delivered to one location. The Food Bank is accepting certificates for turkeys. If you have a certificate you would like to donate, please call Mary. Thanks for your generosity and Happy Thanksgiving to you all. Mr. and Mrs. Roth who reside at 12 Jessica Lane introduced themselves as new to the Homeowners Association but not new to the Park. They lived in the Park many years ago and purchased Duggan’s old house now that they have returned. Welcome back to Columbia Park and to the Homeowners/Tenants Association. @ 10 a.m. for Areas 2, 5 and 6 at the German Club. located at 5665 Great Northern Blvd. just North of Butternut Ridge. of questions that you need to answer. Identify the date of purchase for your manufactured home currently located in Columbia Park. Identify the purchase price for your manufactured home currently located in Columbia Park. 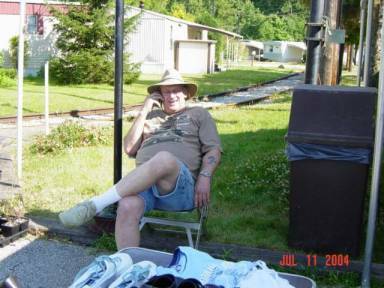 Identify the year, make, model size of your manufactured home currently located in Columbia Park. currently located in Columbia Park. Estimate the current market value of your manufactured home currently located in Columbia Park. Identify the basis for your response to Interrogatory No. 5, such as comparable sales, etc. affected the market value of your manufactured home. Identify the manufactured home community located in Northern Ohio that you used to respond to Interrogatory No. 9. Identify your basis for your response to Interrogatory No. 9 such as comparable sales, etc. Admit that there was no rental increase in the calendar year of 2000.
increases would be minimal, limited and/or affordable”. SWORN TO BEFORE ME AND SUBSCRIBED in my presence this _______ day of ____________, 200__ . President: will convene and chair meeting of the membership and the Council and act as a spokesperson for the Association. Be aware of all bylaws. Can appoint committee chairpersons and be considered a member of all committees except the Nominating Committee. Vice President: will carry out duties of the President in his/her absence and assist President as needed. Vice President will assist Treasurer in his/her absence or emergency situation. A second Vice President may also be elected, if necessary. d. A quorum of 50% of the Council members and a majority of the Executive Board are required before the Council can make a decision. 7. Nominations and Elections: The Nominating Committee shall consist of a minimum of three (3) members. a. The Association shall elect the Executive Board from among the members of the Association. Officers will be elected for a one (1) year term. b. In the event of a vacancy on the Executive Board, a replacement will be selected by voice vote at the next general meeting to fill out the remainder of the term of that position. d. In the event of a vacancy in the office of President, this vacancy shall be filled by the Vice President subject to the approval of the Council. a. An annual audit shall be made of the Association’s financial records by an Audit Committee composed of 2 or 3 members appointed by the Audit Committee chairperson with the Treasurer in attendance. 11. Budget: The Budget Committee shall be composed of the Treasurer and Auditor. The budget should be submitted to the Council at the March meeting. 12. Ammendment: These by-laws may be updated yearly, in February, by the Bylaws Committee. Any changes/additions proposed by this committee may be amended by 2/3 of the members at a regular membership meeting.